In the most concrete sign yet of his plans to thoroughly reshape the beleaguered church he’s inherited, Philadelphia’s Archbishop Charles Chaput OFM Cap. is giving up the mansion at the city’s edge which his predecessors have called home for the last 75 years. Less than four months after taking the reins of the 1.2 million-member Northeastern “supertanker,” Chaput reportedly decided to seek a buyer for the historic, 12,600 square-foot Cardinal's Residence and its 8.9-acre grounds over recent weeks, according to archdiocesan sources. No official announcement of the move is expected to be made. Seen by many locals as the quintessential symbol of the “complacency and pride” that have long marked the city’s ecclesial culture, the property's placement on the market is said to have received “strong support” both from Chaput's Finance Council and Council of Priests, who were consulted on the move over the last six weeks. As the value of a successful deal is almost certain to exceed the canonical threshold for a bishop’s alienation of diocesan property on his own initiative (currently $7.5 million for larger US dioceses), a transfer of ownership would require the approval of the Holy See. Home to the city's top prelate since 1935, when Cardinal Dennis Dougherty purchased it for $215,000, it is unclear where the current occupants of 5700 City Avenue -- the Capuchin prelate, a duo of priest-aides and the two Sisters of Mercy of Alma who staff the household -- would relocate on the completion of a sale. During his 14 years as archbishop of Denver, Chaput lived alone in a cozy, Mission-style rancher on the campus that housed his seminary and the diocesan offices. Before Dougherty’s move to the antebellum house on Philadelphia's border with suburban Montgomery County, a half-century of the city’s archbishops were based at what's now the Rectory of the Cathedral-Basilica of Saints Peter and Paul on Race Street, in the heart of the urban hub. The archdiocese’s four active auxiliaries live in former rectories or convents that had been vacant in their respective geographic regions. While the adjacent St Joseph’s University has sought for decades to expand across Cardinal Avenue by acquiring the residence parcel -- even placing a standing offer for the property in the mid-2000s -- an open bidding process is expected to be held. Despite having spent $92.5 million in 2005 to buy and adapt a 38-acre parcel across the street, the Jesuit-run school is still considered the most likely party to make the winning offer for its neighboring diocesan plot. 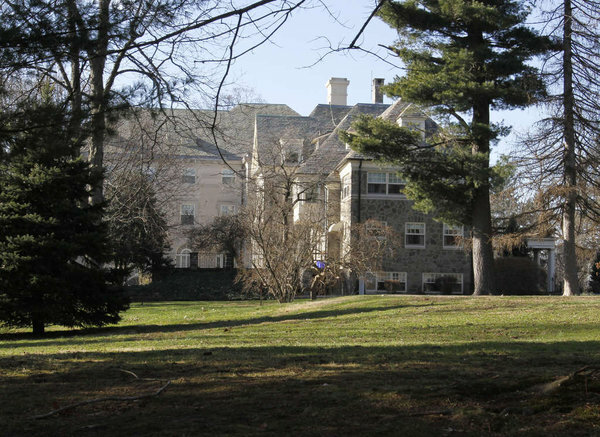 That result would echo the most prominent house-sale by an American hierarch in recent years: Cardinal Sean O’Malley’s $172 million, three-part deal with Boston College for the famed Brighton Chancery compound, whose 65 acres served as the nerve center of the New England archdiocese for over a century. On at least one account, the timing of Chaput’s first major Philly move is notable: a week from today (6 January), the archbishop will receive the recommendations of a year-long Blue Ribbon Commission studying the future of Catholic education in his new charge, which is likely to propose the most significant closing and consolidation of schools undertaken to date by an American diocese. In addition, a strategic planning effort to gauge the viability of the archdiocese's parish configuration was recently begun, and is expected to see the closing or merger of a sizable chunk of the 267 churches at the process' conclusion in the first half of 2013. Once upon a time, meanwhile, in an age now past, New Year’s Day would bring the residence’s grandest function hosted by its buyer, at which attendees would be briefed on the state of the archdiocese. Seven decades later, the message of 2012 is already shaping up to be starkly different: the reality of a Philadelphia Catholicism far removed from the booming empire of which Dougherty would annually boast.